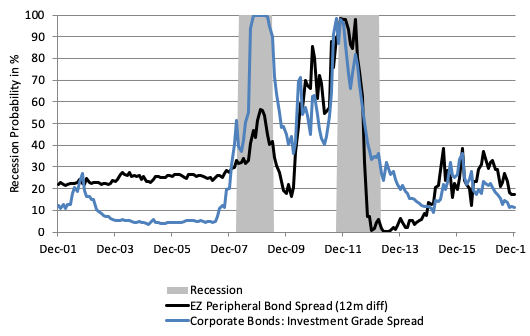 There is a strong consensus in the existing literature that term spread is a reliable indicator of impending recession. According to Estrella and Hardouvelis (1991), a positive term spread is a leading indicator for an expansion of consumption, investment, and production. This finding has also been corroborated by more recent research (e.g. Chauvet and Potter 2005, Rudebusch and Williams 2009, and Fornari and Lemke 2010). While term spread has delivered strong predictive power across different sectors of the yield curve in the euro area, Moneta (2005) identifies the 3m-10yr (i.e. three-month minus 10-year) spread as the specification with the best explanatory power. The choice of term spread to use has also been the subject of debate within the Federal Reserve, with researchers at the Fed’s Board of Governors favouring near-term forward spreads – i.e. 3m T-Bill rates six quarters forward, minus today’s 3m rate (see Engstrom and Sharpe 2018) – and researchers from the Federal Reserve Bank of San Francisco choosing the 3m-10yr spread (Bauer and Mertens 2018). In a recent study, we choose the 10yr-3m spread and assess its ability in predicting euro area recessions (as defined by the CEPR Business Cycle Dating methodology) within the next 12 months, using a standard probit model approach (Fendel et al. 2018). Given that the currency union is a fairly new regime, we are forced to choose a relatively short calibration period for the analysis (2001 to 2017). The first part of the estimation period (2001 to 2008) is characterised by a pretty standard economic environment and orthodox central bank action, while the period that follows is characterised by an economy in a liquidity trap and unconventional monetary policy. 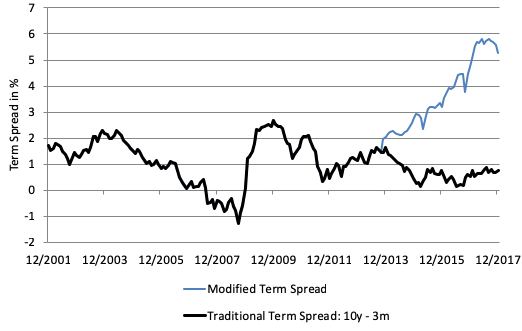 The analysis finds that term spread successfully predicts the euro area recession of 2008–2009, with a lead-time of nine months. The indicator, on the other hand, fails to pick up the second recession beginning in 2011. Somewhat counterintuitively, the model also signals recession probabilities rising in the aftermath of the European sovereign debt crisis and remaining elevated for the time period between 2015–2017, when the euro area economy was actually recovering briskly. The reason for this can be traced back to the ECB’s quantitative easing programme – as the ECB tried to induce economic growth through large-scale asset purchases and advanced forward guidance (Krugman 1999), the associated flattening of the yield curve incorrectly sends recession probabilities higher. In contrast to the conventional interpretation, the cause for this flattening is not necessarily growing concerns on the economic horizon, but rather new monetary instruments exerting a strong influence on the shape of the yield curve. In an attempt to restore the informational content of the term spread measure, we suggest a modified version of the spread that replaces the 3m Euribor rate with a ‘shadow policy rate’ from November 2013 onwards.1 This shadow rate is estimated by Wu and Xia (2016) – it is meant to capture the effects of unconventional monetary policy on the short-term interest rate, and is not bounded by 0%. In contrast to the dynamics seen when using the traditional term spread, the ECB’s unconventional monetary policy leads to a significant ‘shadow’ steepening of the curve, as the effective short-term interest rate turns deeply negative (see Figure 1). 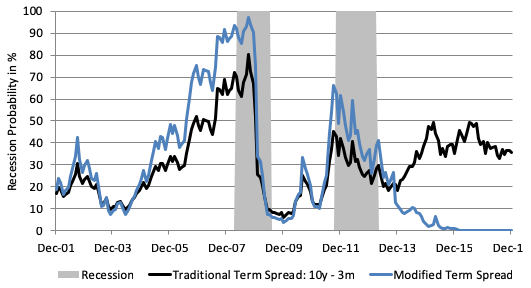 This revised version of the term spread successfully predicts the 2011 recession with a lead time of two months, and signals an average recession probability above 50% during the first half of the recession. It also sees recession probabilities falling to 1% for the period between January 2015 and December 2017, which compares to an average recession signal of 40%, indicated by the traditional term spread over the same period (Figure 2). Given this, we find that switching to the shadow rate in face of the zero lower bound brings a valuable perspective on the term spread as an input factor to recession models. The next step in the analysis is to broaden the range of indicators used to assess recession probabilities. In particular, we estimate univariate probit models using 41 explanatory variables belonging to the following macro categories: rates, money supply, competitiveness, business activity, financing conditions, risk aversion, industrial data, inflation, commodities, and private sector wealth. Results suggest that these variables offer useful additional information for predicting recessions. The following six variables in particular can be shown to outperform the modified term spread: the 12-month change of real M1 (narrow money supply); the 12-month change of the Purchasing Managers Index; the level of the euro aggregate option-adjusted-spread; the 12-month change of the peripheral sovereign bond spread (GDP weighted spread of Greece, Spain, Italy, Ireland, and Portugal versus Germany); the level of Terms of Trade; and the EUR/USD foreign exchange level. The lead to a recession – the first time an indicator crosses the 50% threshold in the 12 months leading up to a recession. False alarm and crisis detected – based on a 50% threshold, the analysis summarises the number of correct signals (Alessi and Detken 2009). The area under the receiver operating curve (AUROC), which assesses the predictive power of a binary classification system as the threshold is varied to be independent of the somewhat arbitrary 50% threshold (Liu and Moench 2014). The analysis finds that the best performing indicator for predicting recessions is real narrow money growth (i.e. 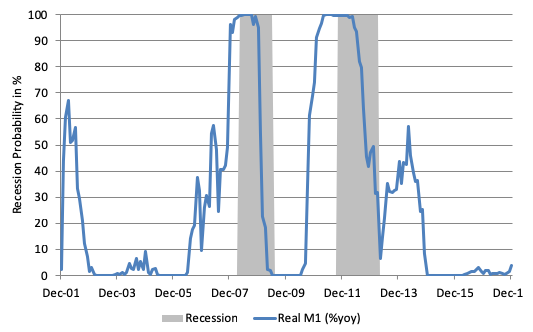 the 12-month change of real M1, which includes cash and bank short term liabilities; see Figure 3). This indicator detects 73% of all recession months and issues only 5% false positive signals. In the run-up to both recessions, the indicator crosses the 50% threshold 12 months before the start of each economic downturn and signals heightened recession risks in 2003 when economic growth had been lingering in negative territory for three months. 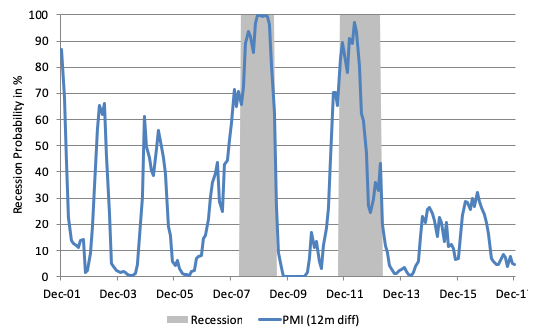 Second best seems to be the 12-month change of the Purchasing Managers’ Index, which detects 60% of crisis months and has 7% false positives (see Figure 4). While this indicator has a shorter lead-time than other alternatives, it remains elevated throughout the crisis and serves as a variable that carries additional value for the length of a recession. Third best is the cohort of variables composed of indicators from financing conditions, which include peripheral sovereign bond spreads and corporate bond spreads (Figure 5), followed by competitiveness indicators, which include the euro/US dollar exchange rate and terms of trade (Figure 6). The yield curve largely lost its predictive power in the euro area as the ECB hit the zero lower bound in rates earlier this decade. To remove the downward rigidity of short rates, we suggest a modified version of term spread which uses the ‘shadow policy rate’, rather than the 3-month rate, as the front leg of the spread. This revised measure of the yield curve leads to much improved recession forecasting power. The analysis, however, also finds that there are alternative indicators of recession (e.g. real money growth, or the Purchasing Managers’ Index) that outperform even this improved term spread. We therefore suggest looking at a range of measures to assess recession probability in the euro area rather than being overly focused on the shape of the yield curve. Alessi, L and C Detken (2009), “Real time early warning indicators for costly asset price boom/bust cycles. 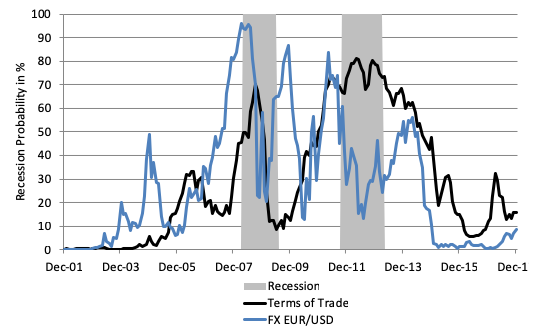 A role for global liquidity,” ECB, Working paper series no 1039. Bauer, M and T Mertens (2018), “Information in the yield curve about future recessions,” Federal Reserve Bank of San Francisco Economic Letters 2018-20. Chauvet, M and S Potter (2005), “Forecasting recessions using the yield curve,” Journal of Forecasting 24(2): 77–103. Engstrom, E and S Sharpe (2018), “(Don't fear) the yield curve,” FEDS Notes. Estrella, A and G A Hardouvelis (1991), “The term structure as a predictor of real economic activity,” Journal of Finance 46(2): 555–576. Fels, J (2018), “Will the Fed yield to the yield curve?” PIMCO Blog Macro Matters. Fendel, R, N Mai and O Mohr (2018), “Recession probabilities for the Eurozone at the zero lower bound: Challenges to the term spread and rise of alternatives,” WHU – Otto Beisheim School of Management, Working paper series in Economics 18/04. Feroli, M (2018), “US: Yield curve flattening, from 1875 to the present,” JPM Research. Fornari F and W Lemke (2010), “Predicting recession probabilities with financial variables over multiple horizons,” ECB Working paper series 1255. Gerlach, S and R Stuart (2018), “The term structure and recessions before the Fed,” VoxEU.org, 11 July. Krugman, P (1999), “It’s baaack: Japan’s slump and the return of the liquidity trap,” Brookings Papers on Economic Activity 2: 137–205. Liu, W and E Moench (2014), What predicts US recessions?, Federal Reserve Bank of New York, Staff Report no 691. Moneta, F (2005), “Does the yield spread predict recessions in the Euro area?” International Finance 8(2): 263–301. Rudebusch, G D and J C Williams (2009), “Forecasting recessions: The puzzle of the enduring power of the yield curve,” Journal of Business & Economic Statistics 27(4): 492–503. Xia, F D and J C Wu (2016), “Measuring the macroeconomic Impact of monetary policy at the zero lower bound,” Journal of Money, Credit, and Banking 48(2-3): 253-291. In November 2013, the ECB lowered the main refinancing rate to 0.25%, while the deposit facility rate was left unchanged at 0%, showing signs of downward rigidity of monetary policy.